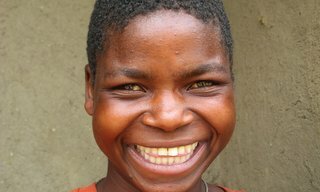 Bethany is a 15-year-old girl living in the rural village of Mcheneke, Malawi. Her smile defies the hardship she is liv­ing with as a teenager who has lost both of her parents.At the age of two, Bethany contracted a debilitating illness that left her mentally impaired and paralyzed on one side of her body. She is now unable to use one of her arms and is unable to attend school due to her dis­ability.Until recently, Bethany had been living with her grandmother, but due to a breakdown in their relationship she has been aban­doned by her grandmother and is living alone in a one-roomed hut. She had been spending all her time sitting in her doorway, watching her community pass her by. She was with­out food or blankets and was chronically hungry, cold and desperate for human connection. But Bethany is not forgotten. Esther, a local Care Worker with Umodzi Community Based Organization (CBO) now visits Bethany every day! Esther helps by fetching water and bringing Bethany food. More than the practical support she gives Bethany, Esther's attention communicates to Bethany that she is valued and loved by her heavenly Father who will not abandon her. Esther’s regular home visits also give a message to the surrounding com­munity that Bethany is loved and cared for, providing a level of security for this vulnerable 15-year-old girl. After years of neglect and abuse, you can see Bethany is smiling again. When asked about her dreams she said only that she might have enough food for the day and a warm blanket at night. Through the 3 Essential Services program run by local volunteers at Umodzi CBO and funded by Christ Church and Wellspring Church in Calfornia, Bethany will re­ceive one nutritious meal a day, a blanket, and access to education and basic health care. Esther will continue fighting for Bethany, loving her as a mother, and hoping to find a way for her to attend school or receive an education at home. Now when Bethany sits alone, she knows it is only a matter of time until Esther comes to visit her. It is this kind of love and compassion that will help a young girl like Bethany over­come the tragedies in her life, and show her that there is hope.